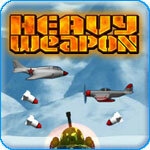 Heavy Weapon Game Review - Download and Play Free Version! Jump in your atomic tank and take on the whole Red Empire Side-scrolling, shoot-em-up style! Upgradeable weapons for your tank. Two modes of play, survival and mission. Communists have taken over the world and you are the only hope left! Jump in your atomic tank and take on the whole Red Empire - side-scrolling, shoot-em-up style! If you are missing the simple, mass-firepower, kill everything arcade gaming of the 1980s you need to jump on Heavy Weapon. Battle through 19 intense missions to infiltrate the Communist Empire and destroy everything they throw at you. From an assortment of jets, helicopters, land vehicles and even Commie Kong (yes, a giant mechanized gorilla), you won't know what Heavy Weapon will throw at you next! Heavy Weapon Deluxe is a classic arcade style game. You are the driver of the Atomic Tank out to save the world from a communist invasion. You are the only person standing between them and the end of the free world. Each level pits you against hundreds of air and a few land units and culminate with a boss fight. This is a great arcade style game, but lacks the depth most gamers expect. A relatively simple storyline is followed through the missions of this game. You invade various fictitious countries and eliminate as many enemies as you can on your way to the boss. Each country has humorous facts listed at the mission select screen. One country's main export is plutonium. Each mission is played twice with different opponents and improved bosses. The main goal is to get to the Red Star headquarters and eliminate the main boss. Gameplay is what you would expect from a classic arcade shooter style game. 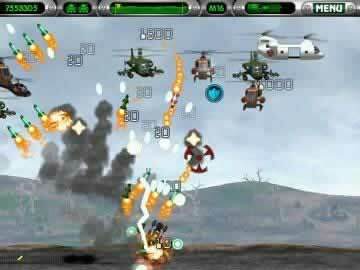 Your tank is at the bottom of the screen and planes will fly overhead dropping bombs as they go. The tank can move left and right and fire 180 degrees around. There are two ways to play this game. In Mission mode you follow the story line. Periodically a friendly helicopter drops supplies and main weapon upgrades. At the end of each level there are six weapons that you can add to your tank. You are given one point for each level you complete. Additions like lasers and a defense orb can be added to help you beat harder levels. In addition to all these weapons you can also receive two types of super weapons. The Mega Laser is assembled by collecting four pieces throughout the level. This weapon only lasts a short time but destroys everything on contact. Next is the Nuke, this is dropped by the friendly helicopter and can be used at anytime to damage everything on the screen. In Survival mode you only have one life and the helicopter drops main and extra weapon upgrades. The only goal is to survive the never ending onslaught as long as you can. The graphics are exactly what you would expect for a game of this type. They are not fantastic but are on par with other arcade style games. Fancy graphics are not necessary so nothing is lost in the game. The sound is very good and includes songs that make you feel heroic. The simplicity of the game is its biggest problem. The controls are all on the mouse so you can't shoot and not move. This becomes difficult because you must shoot and dodge simultaneously. You can't both shoot to the left and drive to the right. Another problem is the lack of difficulty settings. Most levels only change the background and what type of enemies there are. Other than that they are all the same. This can become repetitive after a while making the game less appealing. While Heavy Weapon Deluxe is an entertaining game it is better suited for short amounts of play. The repetitive nature of missions and the limited control you have make it this way. The simple controls and premise make this game suitable for anyone who wants to try out some classic arcade action.